Purpose: To describe the factors that determine the utilization of eye care services in a rural community in South.Western Nigeria. Methods: A descriptive cross-sectional survey using a multistage sampling technique was conducted. The main outcome measure was self-reported previous consultation of an orthodox medical facility for eye care. Results: The study sample included 643 participants. Only 122 (19%) respondents had previously visited orthodox facilities in search of eye care and 24% of those with presenting visual acuity <6/18 had sought eye care. Characteristics associated with previous utilization of eye care services were age of =70 years (odds ratio [OR] ≥ 1.7, P = 0.02); male gender (OR = 1.5, P = 0.04); literacy (OR = 1.7, P = 0.007); and residing close to an eye care facility (OR = 2.8, P < 0.001). Blind respondents were three times more likely to seek eye care (P < 0.001). 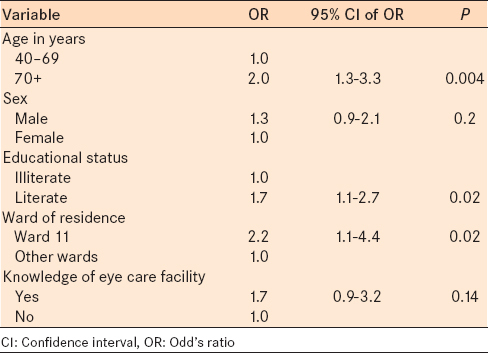 Regression analysis revealed that factors associated with increased likelihood of utilization of eye care services included age ≥70 years; literacy; residence close to an eye facility; being diabetic or hypertensive; history of ocular symptoms, and blindness. Conclusions: These findings suggest that a significant proportion (75%) of adults in the study area are not utilizing eye care services and that blindness is an important determinant of utilization of eye care services. Health education and awareness campaigns about the importance and benefits of seeking eye care early, and the provision of community-based eye care programs are essential to boost the uptake of eye care services in this community as well as other rural areas of West Africa. Utilization of health services is a widely researched topic that has significant implications on the health status of the individual and the community as a whole. In appraising any health care system, it is essential to measure the effective coverage of the services offered by that system and the evaluation of healthcare service utilization is vital in measuring such coverage. In addition, the evaluation of service utilization enhances an understanding of the health behavior of the beneficiaries of healthcare delivery with a view toward optimizing utilization of the services. Utilization of health facilities can be influenced by various factors [Figure 1] including: availability, acceptability, and accessibility of services; the individual's illness behavior; perception of threat to life and function; and the attractiveness of the value gained by using available health facilities.,,,, Andersen's model of healthcare utilization classifies these variables into the following three categories: Predisposing factors, enabling factors, and need factors., These work together to impact the probability that a person would utilize healthcare services. Predisposing factors are present before an illness and refer to an individual's tendency to utilize healthcare services irrespective of whether the services are required. Enabling factors are related to the surrounding circumstances that affect an individual's ability to utilize healthcare services. While a need factor is either the presence of ill-health or the perception of need. For example, a noted change in function or a disability. Need factors may be considered to be more important as they are the immediate determinants of service utilization. Thus, in the presence of predisposing and enabling factors, a need for the healthcare service is required for utilization to actually take place. Eye care service utilization is equally influenced by the factors that affect utilization of health services in general. Several studies have been conducted to better understand the factors that affect the uptake of eye care services.,,, This is as a result of low levels of utilization of eye care services that have been reported from cross-sectional studies in developing countries.,, Even in developed countries, eye care service utilization has been described as less than ideal. The importance of studying the utilization of eye care services lies in the vital role it plays in the actualization of the goal of Vision 2020: The Right to Sight. Therefore, a better understanding of the determinants of utilization among people living in rural communities should aid in the establishment of eye care programs that would reach the underserved and enhance the uptake of eye care services in these communities. In view of the paucity of available literature from West Africa on the topic of utilization of eye care services in rural areas, this survey was designed to identify the determinants of utilization of eye care services among adults in a rural community of South-Western Nigeria. This descriptive cross-sectional survey was conducted in Akinyele Local Government Area of Oyo State in Southwest Nigeria. This local government area is one of the 33 local government areas in Oyo state. It has a population of 211,359 people and is divided into 12 political wards, 10 of which are rural settlements. The local government area has an agriculture-based economy and farming is the main occupation. Health facilities include 15 health districts, each with a primary health center and one general hospital that serves all the districts. These government-run health facilities offer only basic primary eye care services and patients who require secondary care are referred to the tertiary hospital in Ibadan, about 15 km away. There is one eye care facility known as “Sight Foundation” in the local government area that offers refraction and spectacle services. This is a privately owned center run by optometrists and is located in Ward 11. There were unconfirmed reports that there were traditional “eye doctors” who performed couching in some villages. The Nigerian National Health Insurance scheme is still in its infancy, and the vast majority of the rural population does not have health insurance coverage. This study was approved by the University of Ibadan/University College Hospital Institutional Ethical review board. Consent was obtained from the local government authority, community heads as well as the participating individuals. The study followed the tenets of the Declaration of Helsinki. Using a multistage sampling technique, 660 participants were randomly selected from 40 settlements in the 10 rural wards. The sample size was calculated assuming a 95% confidence interval (z = 1.96), estimated utilization of eye care services (p) of 50% in the target population with the precision level (d) set at 5%, a design effect of 1.5 to account for cluster sampling and a nonresponse rate of 10%. The sampling frame for the survey was derived from the 2006 census figures and a list of all the settlements in the local government area. At the first stage of sampling, four settlements were selected in each of the 10 rural wards using the random number package on the EPI 2000 Statistical software (Centers for Disease Control and Prevention [CDC], Atlanta, GA, USA). Subsequently, in each of the 40 settlements, houses were selected for sampling. The first house was determined by spinning a bottle, thereafter, every second house was selected. All eligible individuals residing in the selected houses were enumerated until the required number of subjects calculated for the settlement was obtained. The number of subjects selected in each settlement was based on probability proportional to size. Eligible subjects were adults 40 years or older, who had resided in the study area for at least 1 year and were willing participate in the survey. Following the house-to-house enumeration and registration of eligible participants, a face-to-face interview was performed by trained research assistants using a structured questionnaire to obtain information such as demographic data; medical history; previous utilization of eye care services; and ocular symptoms. For the purpose of this study, utilization of eye care services was defined as any previous consultation of an orthodox medical facility for an eye or vision problem. Visual acuity was tested using a Snellen chart or an Illiterate E chart located 6 m from the participant in a shaded open space in daylight; each eye was tested separately. The last line on the chart, which was read completely, was recorded as the visual acuity. Visual acuity test was then repeated for each eye using a pinhole. Ocular examination was subsequently performed by an ophthalmologist in a dark room inside the subject's house or a nearby alternative room. All subjects underwent a pen torch examination of the external adnexa and anterior segments of both eyes including an assessment of pupillary response. Direct ophthalmoscopy was performed to ascertain lens clarity and to examine the posterior segment. Pupillary dilatation was performed when media opacities precluded a good view of the fundus or if the pupils were too small. Dilation was achieved with the instillation of 1% tropicamide and 2.5% phenylephrine eye drops. Collected data were inputted into a database and analyzed using Statistical Package for Social Sciences (SPSS version 17; IBM Corp., New York, NY, USA). Frequencies and means were generated. Bivariate and multivariate analyses were performed. Any P ≤ 0.05 was considered statistically significant. Altogether 643 participants (1286 eyes) aged ≥40 years completed the face-to-face interview, visual acuity testing, and ocular examination of the 660 people who were enumerated and registered, giving a response rate of 97%. The remaining 17 people, who were not available for all the stages of the survey, were excluded from the further analysis. Three hundred and twenty-seven (51%) respondents were Christian and 316 (49%) were Muslim. A total of 406 (63%) respondents had not received any form of education while 237 (37%) had received at least primary school education. A total of 136 (21%) respondents reported a history of hypertension while 26 (4%) had a history of diabetes mellitus. The majority of respondents (85%) had a history of ocular symptoms, either in the past or at the time of the study. The symptoms included poor vision (73%), eye pain (21%), itching (10%), and red eye (1%). A total of 188 (29%) of them had difficulties with daily routine activities due to poor vision. Ninety-six (15%) respondents never had ocular symptoms. Fifty-eight (9%) respondents had presenting visual acuity worse than 3/60 and were blind in their better eye; 87 (13%) were blind in either eye; and 230 (36%) respondents had at least moderate visual impairment with a presenting visual acuity worse than 6/18 in the better eye. Of the 1286 eyes of the 643 subjects examined, 385 (30%) eyes had cataract; 334 (26%) had refractive errors; 316 eyes (25%) were normal with no clinically obvious abnormality and; 72 eyes (5%) had features suggestive of glaucoma. About 54 eyes (4%) had nonglaucomatous optic atrophy, 32 eyes (2%) had pterygium, 30 (2%) eyes had corneal opacity, and 24 (2%) eyes had undergone cataract surgery. Overall, 587 (91%) respondents had at least one of the following: A history of eye symptoms (past or present); difficulty with their routine daily activities due to visual impairment; a self-reported history of hypertension or diabetes; visual impairment or an eye disorder detected on examination. These respondents were, therefore, considered to have an evaluated or a perceived need for eye care services. A total of 521 (81%) respondents had never sought eye care at any orthodox facility; only 122 (19%) respondents had previously consulted any facility to seek eye care. Among those who had a perceived or evaluated need for eye care services, 122 (21%) had previously sought eye care; while none of the respondents without a need had sought eye care. Only 55 (24%) respondents of the 230 individuals with presenting visual acuity < 6/18 had previously sought eye care, while 25 (25%) of the respondents who were 70 years and above with visual impairment had previously sought eye care. Respondents aged at least 70 years, males and educated individuals had a greater likelihood of seeking eye care. Religious affiliation did not influence the rate of utilization of eye care services. Respondents who were living close to the eye care facility (residents of Ward 11) were almost three times more likely to have sought eye care. In addition, respondents who reported knowledge about eye care facilities were 2½ times more likely to have utilized the services. [Table 1] and [Table 2] present the bivariate analyses evaluating the effect of various factors on the previous utilization of eye care facilities. Respondents with signs of glaucoma had almost five times the likelihood of utilizing services compared to patients with cataracts (odds ratio [OR] = 4.8, P < 0.001). When only those respondents with a need for eye care services were included in the bivariate analysis, older age, male gender, being educated, residing in Ward 11 and knowledge about eye care services were significantly associated with a higher likelihood of seeking eye care [Table 3]. 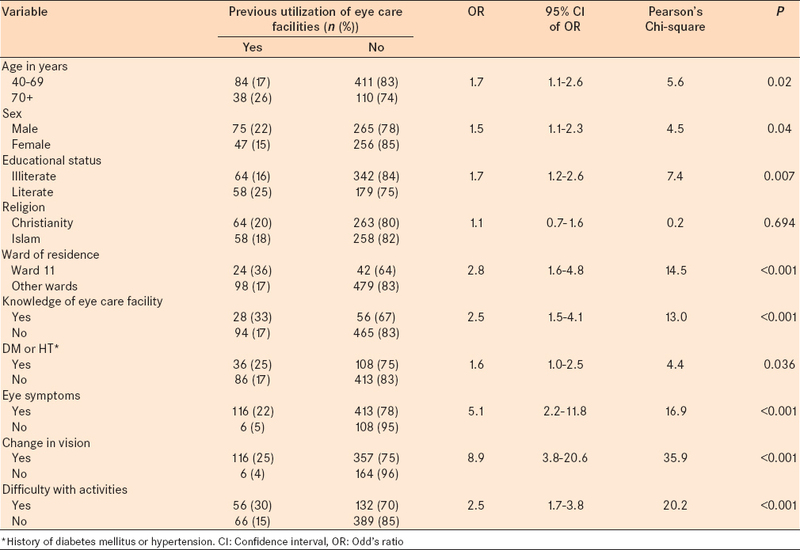 A multivariate logistic regression analysis was performed, adjusting for age, gender, residence, and education, which indicated that age, level of education, ward of residence, history of diabetes or hypertension, history of eye symptoms, and presenting vision of <3/60 still had statistically significant effects on the rate of utilization of eye care services [Table 4]. Respondents who were blind had the highest OR (3.6) for seeking eye care followed by those with eye symptoms (2.9). The effect of gender and knowledge about eye care facilities on utilization was not statistically significant after logistic regression [Table 4]. Multivariate regression analysis was performed to evaluate the effects of predisposing and enabling factors on utilization in those respondents who had an evaluated or perceived need. Age, level of education, and ward of residence were significantly associated with utilization of eye care services in the presence of a need of eye care services; while gender and knowledge about eye care facilities did not have a statistically significant effect [Table 5]. The majority of the studies on the uptake of eye care services have focused primarily on cataract services. In comparison, only a few studies have considered the utilization of eye care services in broader terms. This survey on the use of general eye care services provides an opportunity for discussion of the eye-health seeking behavior of the rural population that was evaluated. The utilization of available eye care services, as evidenced by previous consultation for eye problems by respondents, was markedly low in this rural population. This correlates with the reports from other developing countries (Nepal and India) where the use of eye care services in rural communities ranges from 7% to 35%. The eye care service utilization rate among those with visual impairment is similar to the World Health Organization (WHO) estimate that 25% of those who need eye care globally actually utilize eye services. This finding has strong implications for achieving the goals of Vision 2020 in this local government area as well as similar rural communities in West Africa. Under-utilization of eye care facilities will cause the burden of eye disease and blindness to increase rather than decrease in magnitude if specific interventions are not instituted. A number of factors were found in this study to be significantly associated with increased service utilization. These include predisposing factors such as older age and education; enabling factors such as residence and “need for care” factors, that is, history of hypertension or diabetes, presence of eye symptoms, and visual impairment. The predisposing factors and the enabling factors were associated with utilization among those with a need for eye care as well as among the entire study population (including those without a “need factor”). The implication of these associations is that individuals with these characteristics would be more likely to utilize services when the need arises. Increasing age has been repeatedly found in various population surveys to be strongly associated with an increased predisposition to use eye care services. These include studies from rural and urban populations in developing countries,,, as well as those conducted in developed countries.,,,,, An increased rate of utilizing eye care services among the elderly is consistent with a greater burden of visual impairment and eye disease with increasing age. However, in this study only about a quarter of the respondents who were 70 years and above with presenting visual acuity <6/18 had previously sought eye care. Thus, significant proportion of the elderly who are visually impaired in the population have never consulted an eye care provider and require attention. In addition, among this small group of elderly respondents who had sought eye care in the past, less than half had done so within the last 2 years. This falls short of the recommendation that people over 65 years of age and have no risk factors, should have an eye care visit every 1–2 years. Contrary to the finding of this study, some other studies have found old age to be a barrier to utilization of eye care service.,, A reason for this is the fact that in some societies there is neglect and abandonment of the elderly blind people because of “ageism,” a fatalistic concept in which blindness is viewed as an inevitable accompaniment of growing old. Such communities have been found in the rural areas of Africa and Caribbean islands, e.g., Fiji  and KwaZulu-Natal province  of South Africa. In our study, being educated was associated with an increased likelihood of utilizing eye care services. Various studies have reported similar findings.,,,,,,, This relationship can be attributed to the fact that literate individuals are more knowledgeable and thus, are more likely to seek healthcare. Furthermore, because highly educated people occupy higher socioeconomic classes, they have better access to eye care services and can afford eye care services. Furthermore, literate individuals may have to perform greater visually tasking activities such as reading and driving, which would make them more sensitive to changes in their vision. Alternately, poorly educated individuals may be oblivious of the necessity of regular ocular examinations or may be unable to access these services. We found the respondents who resided in Ward 11 had a greater likelihood of utilizing eye care services. This finding emphasizes the effect of enabling factors on utilization of services as the presence of a recently established private eye care facility (Sight Foundation) in that ward increased awareness and reduced the commuting distance for accessing eye care services. Other studies have also reported that those who live closer to eye care services are more likely to use them. The presence of a history of diabetes mellitus or hypertension made it more likely that respondents had previously sought eye care. This finding, which is similar to other reports,,,,, is likely because these systemic diseases have ocular and vision complications. Patients suffering from these diseases are more likely to have information about the ocular complications and thus, may be more motivated to seek eye care when they have eye problems. Other “need for care” factors such as the presence of eye symptoms and especially visual impairment and blindness have also been observed to be important factors associated with uptake of eye care services in other studies.,, This finding suggests that when people really need to utilize eye care services due to very poor vision, they often seek these services. We cannot explain the observation that those with glaucoma had a greater likelihood for seeking eye care in comparison to those with cataract, and we recommend further investigation of this topic. Knowledge about available eye care services influenced the uptake of services when the bivariate analysis was performed. However, when the effect of confounders were removed in the multivariate analysis the effect of knowledge was not statistically significant. Lewallen and Courtright  have suggested that ignorance is a barrier to eye care utilization while other reports , have stated that ignorance of eye care services does not necessarily constitute a hindrance to those who really need the services. For example, Fletcher et al. observed low utilization of services within communities that had “good knowledge” about eye diseases and their treatment. Therefore, other factors such as those previously discussed are of greater importance in predicting the utilization of services. Further studies would help elucidate this issue. The effect of male gender on utilization was not statistically significant following adjustment for other variables, that is, age and education in logistic regression analysis. This finding is similar to that of Nirmalan et al. who observed that the effect of male gender on utilization was not statistically significant when they adjusted for age and education in a multivariate analysis. Fletcher et al., Gupta and Murthy, and Brilliant et al. in their studies conducted in developing countries (India, Nepal) all reported that men were more likely to seek eye care. A number of reasons have been suggested for this finding including lower literacy rates among females with associated poorer access to information about services; lack of the social support that would enable them to seek care especially when traveling outside the village; and lack of female empowerment to make decisions about household or personal finances. However, other authors have reported that females were more likely to seek or utilize eye care services.,,,,,, These reports are from developed countries, where gender may not constitute a barrier in the populations studied. Further studies would shed more light on the effect of gender on utilization in African communities. Limitations of this study include the lack of accurate birth records, which could result in inaccurate age estimates of the illiterate study participants. Age was estimated relative to the dates of local and national historical events. Second, the possibility of recall bias, which could affect the accuracy of a respondent's report with respect to self-reported utilization of services and medical history. Third, this study only assessed previous visits of respondents to orthodox facilities. No enquiry was made regarding the utilization of alternative modes of healthcare. Therefore, it is possible that the efforts made by the respondents to seek eye care may have been underestimated, as it has been documented that people would most likely first seek help from alternative sources. In addition, the actual use of treatment remedies was not studied. Thus, subjects who had accessed the services may not have utilized them in reality. The fact that the effect of certain enabling factors such as socioeconomic status and cost of services on the utilization of eye care services was not assessed is also a limitation of the study. Another limitation of the study is the possibility of selection bias as indicated by the high proportions of respondents with eye symptoms (past or present) and poor vision. This may have occurred as a result of a bias toward enumerating residents with eye problems because they were more willing to participate in the study compared to those who felt they had no eye problems. This phenomenon is relatively common in underserved rural populations such as this target population. A significant proportion of people in need of eye care services in the rural adult population of Akinyele Local Government Area of Oyo State is not utilizing available eye care services. This may likely result in a greater backlog of people with avoidable visual impairment. The factors that contributed to a higher rate of utilization were older age; greater education; living close to an eye care facility; eye symptoms; and visual impairment or blindness. Gender, religion, and knowledge of services appeared not to significantly affect the uptake of eye care services. Health education and campaigns about the importance and benefits of seeking eye care in a timely fashion are necessary to encourage people in this community to present for treatment before they go blind [Figure 3]. The younger population, the illiterate, and the visually impaired should be the main targets of these promotional eye care campaigns. Provision of community-based eye care programs and facilities such as health education, case finding, and first-aid treatment at affordable cost; in addition to improving the quality of service delivery is essential in order to minimize the barriers to utilization of eye care services in rural communities. Shengelia B, Murray CJ, Adams OB. Beyond access and utilization: Defining and measuring health system coverage. In: Murray CJ, Evans DB, editors. Health Systems Performance Assessment: Debates, Methods and Empiricism. Geneva: World Health Organisation; 2003. Bosch D, Busby A. The five A's of rural home care. Caring 1997;16:20-5. Dawodu OA, Okogie OH, Ukponmwan CO. Pattern of utilisation of eye care services in Benin city, Nigeria. Niger Postgrad Med J 2006;13:323-5. Duggal R. Health care utilisation in India. Health Millions 1994;2:10-2. Kasl SV, Cobb S. Health behavior, illness behavior, and sick role behavior. I. Health and illness behavior. Arch Environ Health 1966;12:246-66. Okonkwo JE, Ngene JN. Determinants of poor utilization of orthodox health facilities in a Nigerian rural community. Niger J Clin Pract 2004;7:74-8. Andersen RM. Revisiting the behavioral model and access to medical care: Does it matter? J Health Soc Behav 1995;36:1-10. Andersen R, Newman JF. Societal and individual determinants of medical care utilization in the United States. Milbank Q 1973;51:95-124. Brian G, Maher L, Ramke J, Palagyi A. Eye care in Fiji: A population-based study of use and barriers. Ophthalmic Epidemiol 2012;19:43-51. Lee L, Ramke J, Blignault I, Casson RJ. Changing barriers to use of eye care services in Timor-Leste: 2005 to 2010. Ophthalmic Epidemiol 2013;20:45-51. Vela C, Samson E, Zunzunegui MV, Haddad S, Aubin MJ, Freeman EE. 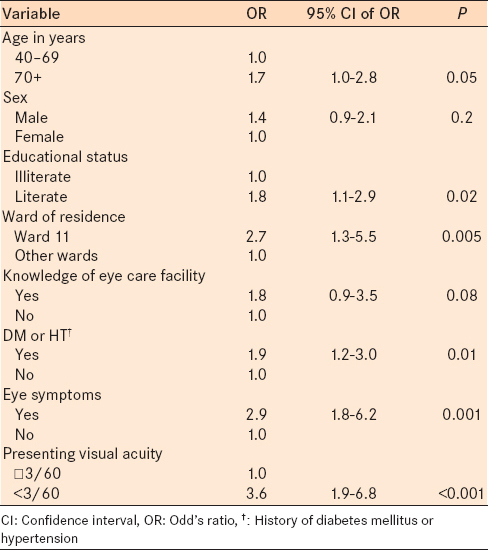 Eye care utilization by older adults in low, middle, and high income countries. BMC Ophthalmol 2012;12:5. Jin YP, Trope GE. Eye care utilization in Canada: Disparity in the publicly funded health care system. Can J Ophthalmol 2011;46:133-8. Dandona R, Dandona L, Naduvilath TJ, McCarty CA, Rao GN. Utilisation of eyecare services in an urban population in southern India: The Andhra Pradesh eye disease study. Br J Ophthalmol 2000;84:22-7. Fletcher AE, Donoghue M, Devavaram J, Thulasiraj RD, Scott S, Abdalla M, et al. Low uptake of eye services in rural India: A challenge for programs of blindness prevention. Arch Ophthalmol 1999;117:1393-9. Nirmalan PK, Katz J, Robin AL, Krishnadas R, Ramakrishnan R, Thulasiraj RD, et al. Utilisation of eye care services in rural south India: The Aravind comprehensive eye survey. Br J Ophthalmol 2004;88:1237-41. Robin AL, Nirmalan PK, Krishnadas R, Ramakrishnan R, Katz J, Tielsch J, et al. The utilization of eye care services by persons with glaucoma in rural south India. Trans Am Ophthalmol Soc 2004;102:47-54. Fotouhi A, Hashemi H, Mohammad K. Eye care utilization patterns in Tehran population: A population based cross-sectional study. BMC Ophthalmol 2006;6:4. Donoghue M. People who don't use eye services: 'Making the invisible visible'. Community Eye Health 1999;12:36-8.
du Toit R, Ramke J, Naduvilath T, Brian G. Awareness and use of eye care services in Fiji. Ophthalmic Epidemiol 2006;13:309-20. Bylsma GW, Le A, Mukesh BN, Taylor HR, McCarty CA. Utilization of eye care services by Victorians likely to benefit from eye care. Clin Experiment Ophthalmol 2004;32:573-7. Orr P, Barrón Y, Schein OD, Rubin GS, West SK. 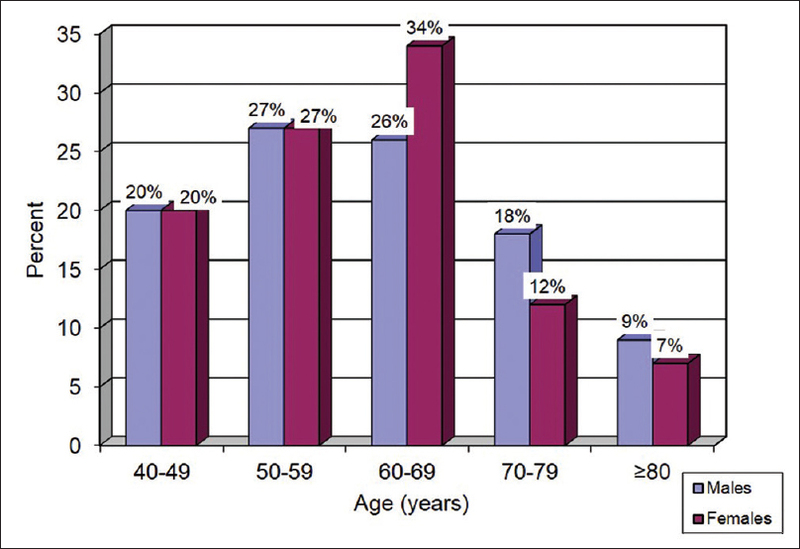 Eye care utilization by older Americans: The SEE Project. Salisbury Eye Evaluation. Ophthalmology 1999;106:904-9. 23. Wang JJ, Mitchell P, Smith W. Use of eye care services by older Australians: The Blue Mountains Eye Study. Aust N Z J Ophthalmol 1999;27:294-300. 24. American Academy of Ophthalmology. Preferred Practice Patterns Committee. Preferred Practice Pattern® Guidelines. Comprehensive Adult Medical Eye Evaluation. San Francisco, CA: American Academy of Ophthalmology; 2010. 25. Lewallen S, Courtright P. Recognising and reducing barriers to cataract surgery. Community Eye Health 2000;13:20-1. 26. Rotchford AP, Rotchford KM, Mthethwa LP, Johnson GJ. Reasons for poor cataract surgery uptake - a qualitative study in rural South Africa. Trop Med Int Health 2002;7:288-92. 27. Rahmani B, Tielsch JM, Katz J, Gottsch J, Quigley H, Javitt J, et al. The cause-specific prevalence of visual impairment in an urban population. The Baltimore Eye Survey. Ophthalmology 1996;103:1721-6. 28. Schaumberg DA, Christen WG, Glynn RJ, Buring JE. Demographic predictors of eye care utilization among women. Med Care 2000;38:638-46. 29. Fong CS, Wang JJ, Rochtchina E, Schneider J, Jakobsen KB, Smith W, et al. Survey effect on use of eye care by older persons with correctable visual impairment. Ophthalmic Epidemiol 2009;16:249-53. 30. Müller A, Keeffe JE, Taylor HR. Changes in eye care utilization following an eye health promotion campaign. Clin Experiment Ophthalmol 2007;35:305-9. Gupta SK, Murthy GV. Where do persons with blindness caused by cataracts in rural areas of India seek treatment and why? Arch Ophthalmol 1995;113:1337-40. Brilliant GE, Lepkowski JM, Zurita B, Thulasiraj RD. Social determinants of cataract surgery utilization in south India. The Operations Research Group. Arch Ophthalmol 1991;109:584-9. Baker RS, Bazargan M, Bazargan-Hejazi S, Calderón JL. Access to vision care in an urban low-income multiethnic population. Ophthalmic Epidemiol 2005;12:1-12. Poudyal B. Traditional healers as eye team members in Nepal. Community Eye Health 1997;10:4-5.